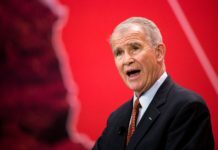 FAIRFAX, VIRGINIA (The Borowitz Report)—Asserting that “heroic measures” were needed to save the National Rifle Association from financial catastrophe, the N.R.A.’s president, Oliver North, announced plans to sell arms to Iran. “Iran needs weapons, and, Lord knows, we have a lot of weapons lying around,” North told reporters on Sunday. “This is the definition of a win-win.” North said that he came up with the idea of selling arms to Iran because “the Iranians were always great to deal with” and “never cared where the money was going to.” The N.R.A. president said that his next move was to establish new contacts in Iran. “Back in the day, I remember there was an Ayatollah there, but I think it’s a new Ayatollah now,” he said. 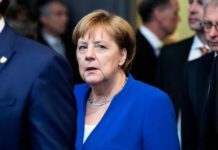 “I wish I could take a look at my old documents, but I guess I had them shredded.” North said that, if Iran is not interested in purchasing arms, the cash-strapped organization would resort to other ways of raising funds, such as selling used office furniture or members of Congress. cards. laws. “Given that Americans have been required to show I.D. 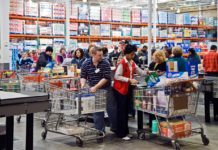 to buy food for years, it’s amazing that people still try to get away with this,” Carol Foyler, a supermarket cashier in Fresno, California, said. in my other pants,’ or some B.S. Believe me, I’ve heard it all.” In Cleveland, Ohio, a man attempting to buy a loaf of bread, two yogurts, and a bottle of Fanta tried to use another consumer’s food I.D. “It’s not just people using other people’s food I.D.s to get groceries,” Harland Dorrinson, the store’s security chief, said. laws have served it well, they “need to go further” to prevent rampant abuses of the system. “Requiring people who want groceries to have a food I.D. 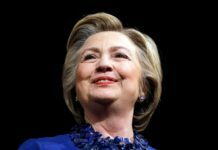 is a good start, but there should also be background checks and a waiting period,” he said. WASHINGTON (The Borowitz Report)—House Republicans on Thursday accused the Deputy Attorney General, Rod Rosenstein, of “secretly and nefariously” implementing a plot to uphold the United States Constitution. 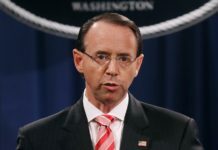 In a joint press conference, Representatives Mark Meadows, of North Carolina, and Jim Jordan, of Ohio, said that they had “ample evidence” that Rosenstein was prepared to protect the Constitution “by any and all means at his disposal.” “There is only one way to describe Rosenstein’s obsession with putting the Constitution before all other concerns,” Meadows said. “Conflict of interest.” “It is almost as if Rod Rosenstein had taken some kind of solemn oath to defend a centuries-old document,” Jordan said. “This should make every American very, very scared.” Though the Republicans have shelved their articles of impeachment against Rosenstein for now, they hope that their impeachment threat will send a clear message to Rosenstein that his reckless allegiance to the Constitution will no longer be tolerated. “If, going forward, Rosenstein uses his position at the Department of Justice to seek justice, he will be crossing a red line,” Meadows said. WASHINGTON (The Borowitz Report)—A Washington, D.C., man has won a nationwide essay contest on the topic “Why Donald J. Trump Shouldn’t Go to Prison.” The man, Brett Kavanaugh, received his award for the winning essay at a ceremony at the White House on Monday night. Kavanaugh’s essay, which was distributed to the press shortly after he was announced as the winner, reads as follows: “Donald J. Trump should never go to prison because he is the President of the United States and the President of the United States is a very important person in the country. It would look bad if visitors from foreign countries came to the United States and asked, ‘Where is your President?’ and we had to say, ‘He is in prison,’ which in my opinion is another reason Donald J. Trump should not go to prison. 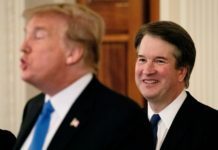 For these reasons, if I am ever in a position to keep Donald J. Trump from going to prison, I will do that (keep him from going to prison).” Shaking Kavanaugh’s hand, Trump heaped praise on him for his “very, very beautiful” essay, calling it “maybe the best essay that has ever been written.” “I did not personally read it, but Ivanka read it aloud to me, and I thought it was fantastic,” Trump said. MOSCOW (The Borowitz Report)—Russian President Vladimir Putin has reportedly made his final choice to replace retiring Supreme Court Justice Anthony Kennedy, Kremlin sources have confirmed. According to those sources, Putin whittled down a lengthy list of possible candidates to just two, Brett M. Kavanaugh and Thomas M. Hardiman, before selecting the one he believes will best advance the interests of the Russian Federation. Those familiar with the selection process said that the Russian President did not consult with Donald J. Trump before making his final decision. “Putin didn’t want one of those ‘too many cooks’ situations,” one Kremlin source said. 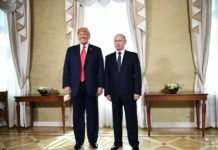 “He told Trump that he would e-mail him the name a good half hour or so before Trump has to announce it to the media.” Surprisingly, the usually brash Putin found the responsibility of choosing the next Supreme Court Justice “daunting,” sources said. 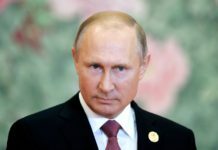 “Nominating a Justice to the United States Supreme Court is one of the most important decisions a Russian President can ever make,” Putin reportedly said.